Claudia has an educational background as a pharmacist and obtained a PhD in Pharmacoepidemiology and a Master in Health Administration (eMBA). After 7 years in managing community pharmacy roles, she moved into clinical drug development and served for 7 years in roles of increasing global responsibility at Organon and Novartis. In the half a decade afterwards, she acted within Novartis internationally in leadership roles in Patient Access, Key Account Management and Public Affairs. She developed had a growing ambition to build more synergy between value-driven pharmaceutical care and the use of digital health technology and invested in learning about Business Development and Health Technology at Erasmus University Rotterdam and MIT Sloan and moved into a Region Europe Digital Innovation role within Novartis. In parallel, Claudia has been a mentor and strategic advisor for various digital health start-ups at the Brightlands Innovation Factory, acts as a volunteer for different (health) charity organizations and is a member of the World Healthcare Forum Advisory Board. Currently, Claudia is the founder of the startup PHARMACAREdotAI. It is an essential book to understand the present and the future of pharmaceutical care practice. Digital health in the pharmaceutical care environment represents a new area of research and one of the most influential factors in the paradigm shift of the pharmaceutical profession. “Pharmaceutical Care in Digital Revolution” is a must-read for pharmacists practicing in hospitals or community pharmacies, students, and health researchers active in the field of (clinical) pharmacy who are interested in the use of technology to advance our field. 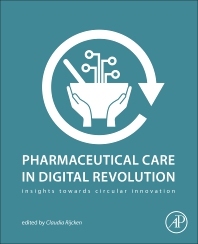 This book is easy to read and provides a broad perspective on how the future of pharmacy may develop and innovate with the help of digital solutions. Usefull as a guide per topic or as a educational textbook on a university level. A must read ! With great interest read the book now that it is available. It clearly describes the future of (digital) pharmaceutical care with a variety of perspectives. As such, it is a must-read for all professionals involved in healthcare and those who participate in improving the pharmaceutical care in near future. This book is essential for pharmacists, not only to be optimally prepared for the day after tomorrow, but also to be inspired and wish for the change to keep coming, and explore the unknown. Easy to read, from the beginning to the end. Practical and informative. It is very promising. I look forward for the day it will be available.